Place all of the ingredients into a blender and pulse until chunky. Place a large skillet over medium heat. 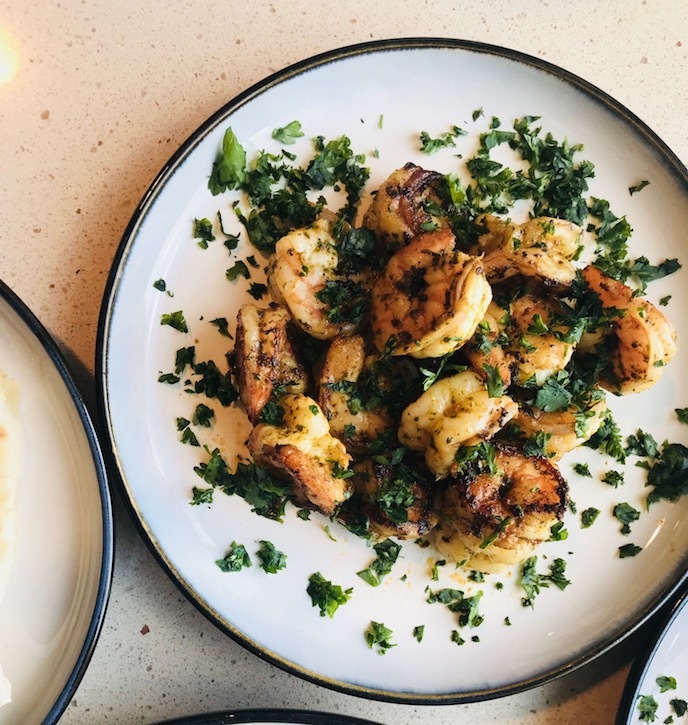 Dry the shrimp well with paper towels then toss the shrimp and sharmoula. Add the shrimp the pan and sauté until cooked through about 3-5 minutes. Garnish with lemons and serve immediately. Tandoori chicken is a fantastic meal filled with rich flavors and aromas and definitely something you only eat when you go to an Indian Restaurant. All of the spices and flavors can be intimidating to a new cook but with an adventurous spirit you can make something that will quickly turn into your favorite recipe. Before you start, check your spices and make sure they are fresh. If they have been in the cabinet since you moved in, toss it. Next, when you by new spices, try hitting up the local Asian/International market. The spices are less expensive and are readily available for this recipe. You can also get basmati rice and all types of cool chutneys and sauces to serve with the chicken. This recipe calls for boneless, skinless chicken thighs because they are cheap, cook quickly and don't dry out. You can pop these on the grill, bake or broil with great results. You can also use whole chicken pieces cut into small portions. Remember, if you want to make your tandoori chicken bright red like they do in the restaurant, plop a few drops of food coloring into the marinade. That's what they do! 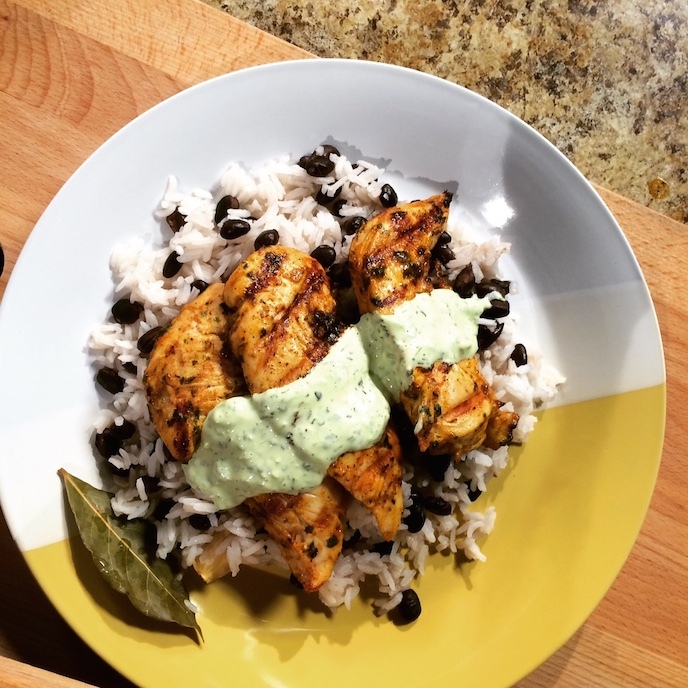 Combine the yogurt, seasonings and the juice of one lemon in a bowl then marinate the chicken for 4-24 hours. Place the chicken on a medium hot grill or 450 F oven and cook until the internal temperature reaches 165 F, about 7-10 minutes on each side. Garnish with fresh lemon and chopped cilantro. Roasting a chicken is a very simple and easy skill that can be done with so many flavors. I like to keep things simple with salt, pepper, lemon, fresh garlic and rosemary. You can pop this in the oven for an hour and it will turn out perfect every time. The goal is to cook the chicken so the meat is moist and tender, while roasting the skin so it is crispy and flavorful. If you dig this method, try seasoning your chix with cumin, chili powder and lime juice for a Mexican theme, use a BBQ dry rub for quick down home flavor, or marinate in honey, soy sauce and chili flakes for a Chinese style dinner. Pre heat the oven to 425 F. Place the chicken on a baking sheet and season on both sides with salt, pepper, olive oil, lemon juice and chopped rosemary. 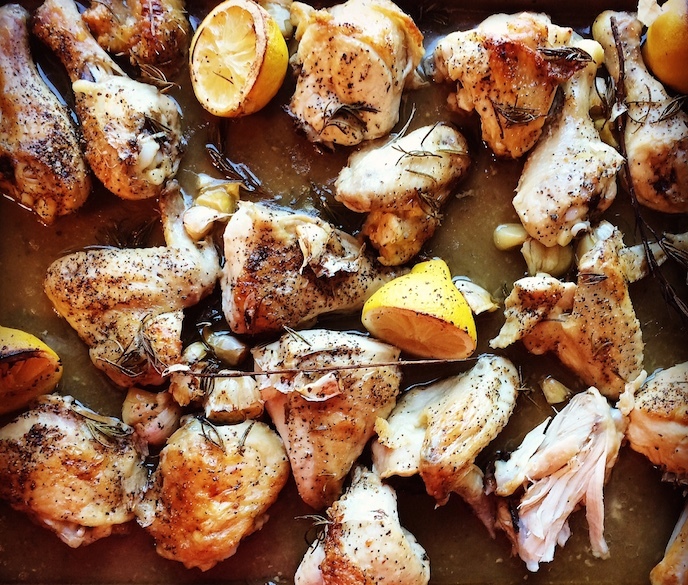 Place the smashed garlic cloves, rosemary stems and lemon rinds throughout the chicken and bake for 1 hour. Using a large spoon, baste the chicken every 20 minutes. Reserve the chicken juices to serve with the chicken. The chicken is done when the temperature of the meat is 165 F and is not longer pink. You can use a meat thermometer, which is the best way, or simply cut into the meat to check for doneness. Place all ingredients into a bowl and marinate for 1 hour. Place your grill over medium heat. When it is hot, place the chicken on the grill and cook for 4-5 minutes on each side or until cooked through. If you want to marinate a whole chicken, make a double batch of the marinade. When it is time to cook, you can bake at 400 F or grill over medium heat for 75-90 minutes. The chicken should reach 165 F in the thickest part of the breast or thigh, not touching the bone. Place a medium saucepan over medium heat. Place all of the ingredients into the pan and bring to a boil for 30 seconds. Cover the pan, reduce the heat to low and cook for 10 minutes. Turn the heat off and let the rice sit for 10 minutes. Carefully remove the lid and fluff the rice with a fork. Place all ingredients into a blender and pulse until smooth. Place the chicken in a bowl and toss with the salt, pepper and cornstarch. Pre heat a large skillet over medium heat, add the 1 tablespoon of oil to the pan, when it smokes add the chicken in a single layer. Cook the chicken for 3 minutes. Turn the chicken and cook for 3 minutes to brown on all sides and cook through, then remove the chicken from the pan. Add 1 tablespoon of oil to the pan, when it smokes add the onions and peppers. Toss the veggies, cook for 2-3 minutes until lightly browned, then remove from the pan. Add 1 tablespoon of oil to the pan, then add the garlic, ginger and chili flakes. 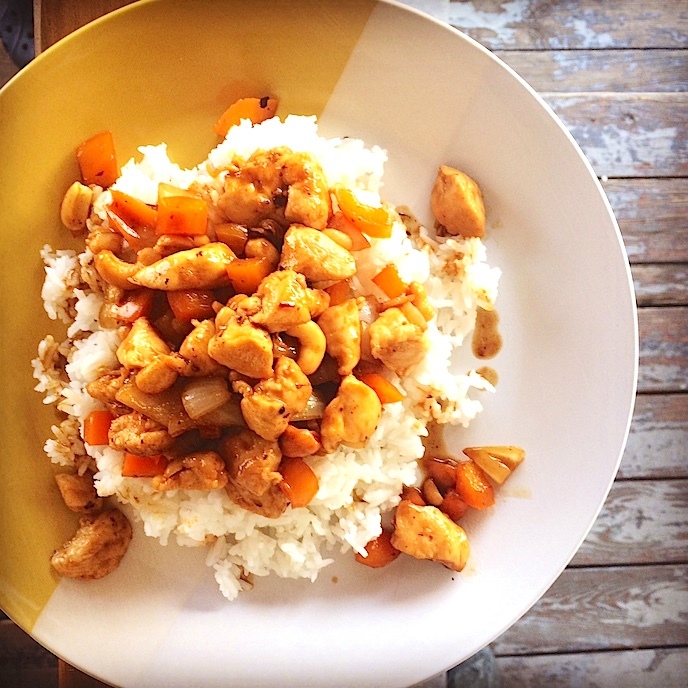 Cook this for 15 seconds and then add the soy sauce, rice wine vinegar and sugar. Cook for 15 - 30 seconds, then add the chicken and vegetables back to the pan. Toss the mixture to cover in the sauce and cook until thick, about 2 minutes. Toss in the peanuts and serve immediately. Falafel is a staple street food in Middle Eastern countries and throughout Europe. A good falafel is made by stuffing a big pita with fried chickpea fritters, seasoned with warm spices like, cumin, paprika and coriander. These crispy fritters are then topped with salads made from fresh chopped tomato, onions and cucumber as well as a parsley and bulgar wheat salad called tabouleh. A falafel is then finished off with a drizzle of tahini (sesame seed paste) and dollop of greek yogurt tzadziki. If your lucky, some places will top the whole thing off with French fries. This sandwich is inexpensive to make, has all of the food groups, is vegetarian and bursting with fresh flavors and textures. Place the first 8 ingredients into a quart sized freezer bag, seal tightly and smash with hands to combine. You can also pulse the all of the ingredients in a food processor until combined. Form 4-8 equal sized balls and then press into patty. Place a large skillet over medium heat and add the oil. When the oil starts to smoke lightly, carefully add the patties to the pan. Fry the patties on one side for 2 minutes and then turn, continue to cook the other side until golden brown. Drain the falafel well on paper towels and season with salt and pepper. 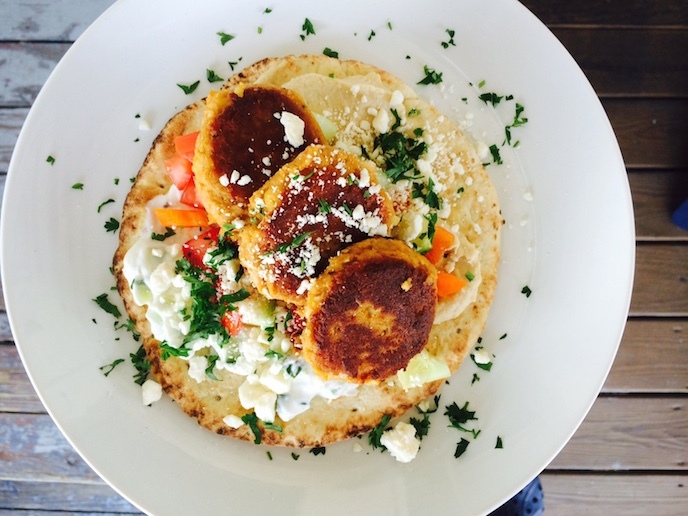 You can serve you falafel on pita bread or any middle easter or greek flat bread. Top your falafel with chopped tomato, cucumber, pickles, greek yogurt, hummus, tabouleh, tahini and even french fries. Jerk is a term referring to a spicy marinade/paste made from habanero peppers, herbs, citrus, garlic and ginger and is a staple of island culture and flavors. In Jamaica, jerked foods are served from roadside, wood-fired grills with the flavors and aromas pulling people in from all over the community. The term jerk originated from the mexican word "charqui" which means dried meat or jerky. The recipe below is pretty darned authentic with whole fresh ingredients, herbs and spices. You can also make a big batch of this paste and keep it in the fridge for up to a month. Place all of the ingredients into a blender and pulse until smooth. Place the pork into a bowl and marinate with the jerk paste overnight. Place the grill over medium high heat and grill the pork for 5 minutes on either sides or until cooked through. Soak the rice noodles in hot water for 8-10 minutes. Heat a wok or large pan on high heat. Add the oil and let it start to smoke. Add the garlic and eggs then scramble well. Add the noodles and sauce and toss well. Plate immediately, garnish and serve. Place these ingredients into a bowl and mix together until the sugar is dissolved. Garnish the hot pad Thai with the above ingredients anyway you or your guests like.